In my recent post on Elena Ferrante’s Frantumaglia (a collection of the Italian writer’s interviews and letters), I touched on the importance of one of her lesser-known works. Her third novel can be a little overlooked, sandwiched between the early successes (Troubling Love and The Days of Abandonment) and the all-conquering Neapolitan Novels, but the more I read of Ferrante’s opinions, the clearer it became that it was a rather personal work, and perhaps the key to her writing. I think that merits a look, don’t you? The Lost Daughter (translated by Ann Goldstein, review copy courtesy of Europa Editions) introduces us to another of Ferrante’s strong women. University lecturer Leda, long divorced from her husband, has just seen her grown-up daughters move to Toronto to be with their father, leaving her to enjoy her independence as she sees fit. With the summer holidays arriving, she decides to head off to the coast for a month, where she intends to spend her time reading and generally relaxing at the beach. After a few days, though, her routine is disturbed by the arrival of a large group of tourists, an extended family of rowdy Neapolitans, reminding her a little too much of her own younger years. One of the family stands out, a young mother with a little girl (and a doll in tow), and despite Leda’s desire to be alone, she can’t help watching the young woman and wanting to make contact. Gradually, as the story starts to swing between the events on the beach and Leda’s own family life, we realise that this need to connect with the young mother has much to do with Leda’s relationship with her mother – and her own daughters. It’s evident early on that the claims made in Frantumaglia were on the mark, as The Lost Daughter has all the signs of being a very personal novel. It’s an examination of the relationship between mothers and daughters and the way a beautiful bond can feel as if it has turned into something suffocating, tempting you to cut free. There’s also, of course, the return to Naples, even if the novel isn’t actually set there. No matter how far we travel from our roots, all it takes is a reminder of where we came from to plunge us back into that environment, dragging up all our fears in the process. I looked at Nina. She made senseless gestures, she touched her forehead, she went to the right, then turned abruptly back to the left. It was as if from her very guts something were sucking the life from her face. Her skin turned yellow, her lively eyes were mad with anxiety. She couldn’t find the child, she had lost her. As much as The Lost Daughter focuses on Leda and Nina, much of the novel is devoted to flashbacks to Leda’s own experience of motherhood with her daughters, Bianca and Marta. She describes the struggles of being left alone with young children, failing to balance work and home duties, going on to show how the relationship doesn’t get any easier when the girls move into their teens. The mistakes she makes when trying to welcome her daughters’ boyfriends drive a new wedge between the women of the family, and Leda can’t help but reflect on her issues with her own, beautiful, mother. What follows is a surprising decision, one that rocks the reader. From the first page, Leda has been the voice of the novel, our way into the story, but the decisions she makes regarding her family force us to reconsider how we feel about her, and her judgements. Even in the present-day strand, we see her slowly falling apart. Intimidated by the raw aggression of the Neapolitans, she becomes nervous and afraid to venture out, yet paradoxically this also causes her to alter her behaviour towards the men around her, flirting with the handsome twenty-something Gino and the ageing Lothario, Giovanni. Perhaps it’s this confusion that leads her to take Elena’s doll, an action with far-reaching consequences. While it may appear to be a random action, it gradually becomes clear that there’s a method to her madness as the writer introduces other dolls from Leda’s past. First we see Leda receiving a doll, obsessively playing with it, and later, when her daughter defaces it with marker pen, she hurls it from the balcony in a fit of anger (let’s not forget how the image of the doll connects The Lost Daughter with the first scenes of My Brilliant Friend…). It’s hard not to attribute allegorical qualities to the doll, with the filthy water oozing out of its orifices when Leda attempts to clean it symbolic of the darkness within Leda herself. The Lost Daughter is a story where the past is just as important as the present, and even if the balance isn’t always perfect (the ending seems a little hurried and Nina’s story comes off as slightly underdeveloped), it’s an excellent read. There’s the usual breathless pace of the plot, and the added feeling that the novel forms an important part of Ferrante’s oeuvre. 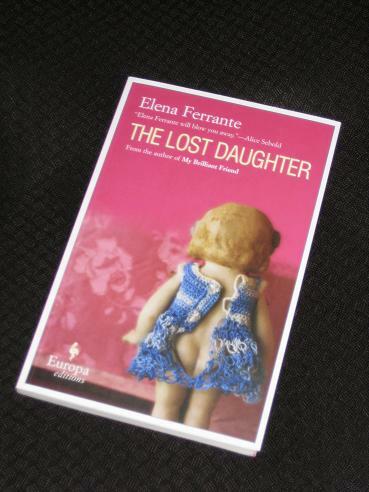 Of all Ferrante’s heroines, Leda appears to be the figure closest to the writer, compelling and brutally honest, a woman driven to choose between motherhood and personal desires – it’s no wonder the writer felt she was exposing herself a little too much in this novel. I read this as part of a book club – as you might imagine, Leda’s behaviour led to a fascinating discussion! Grant – I can imagine! It’s a clever book in the way Leda’s facade gradually crumbles, even if it doesn’t quite fit together as well as it might.